Fancy a denim jacket with real heritage? You need the Lee 101J 1966 jacket. This is a replica of the Lee 101J from 1966, made famous by The Beatles, who wore these very same jackets in that year for a Scandinavian photo shoot. The jacket is made from premium Japanese denim and has an adjustable waist, two button-fastening chest pockets and the Lee tab on the chest pocket. Yours from Oi Polloi for £159.99. Coinciding with the 50th anniversary of the release of Miles Davis’ seminal Birth of The Cool LP, Jean-Paul Séculaire from Right On! is launching a new night dedicated to the sounds of ‘real’ jazz – think bebop, cool, hard bop, soul-jazz, Latin, funk and blues, all from his collection of original vinyl LPs and 45s. 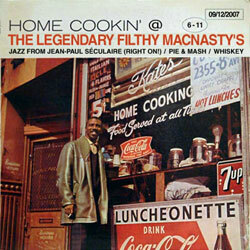 Home Cookin’ is the name of this Sunday session at popular mod haunt Filthy MacNasty’s, where you can drink and make merry as well as sampling the pie and mash from the newly fitted kitchen. Best of all, it’s free to get in. Two girls from the North of England, Yvonne & Brenda, come down to London in search of ‘The Scene’, which they’ve heard is located somewhere around ‘Carnaby Street’ and we follow their hapless journey from the drive of St Pancras Station, forty years before the glittering refit that transformed it into a sight worth seeing, but here, begrimed with eighty years of soot, and in disrepair, to Camden Town, the result of asking a drunken gentleman of the road the way to that more fashionable street in W1, all the way to that dreamy thoroughfare of fashion, to the more upmarket of West London’s boutiques, fashion shoots and Yvonne’s thwarted pop career, then the long walk back to St Pancras and home. 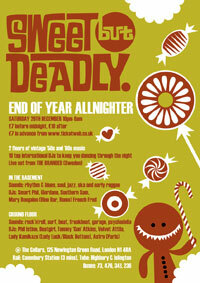 On Saturday 29th December the Sweet but Deadly collective celebrate a great year of dos by holding an end of year party in new underground venue – The Cellars in Newington Green (N1). 10 DJs from all over Europe, with 2 rooms of music ranging from rhythm and blues, soul, jazz, ska and reggae, to rockabilly, surf, beat, garage, and psychedelia. And to add a some special Swedish seasoning to the mix, raucous 3 piece ‘rhythm’n’booze’ garage rockers The Branded fly over to play a live set. Doors: 10pm-6am Admission: £7 before midnight, £10 after. Cheap advance tickets are available from www.ticketweb.co.uk. 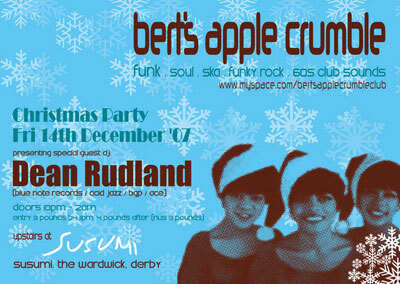 Christmas is coming early in Derby with the Christmas Special of Bert’s Apple Crumble. Resident DJs Craig Simpson & Dom Cater are joined by a top-notch guest in the form of Dean Rudland (BGP, Acid Jazz, Ace, Blue Note Records), a man responsible for some of the finest soul, funk and jazz compilations out there – check your collection – his name will be in it.